Since it’s almost December (GASP! ), I decided to devote today’s post to two 2012 picture books that I really liked a whole heapin’ lot, yet I had never gotten around to posting about. I do manage, I think, to post about picture books here at 7-Imp in a relatively timely manner, but these two fall into the better-late-than-never category. Here, I post about them before I see that the year has all sneaky-like ended on us — and in my own little effort to tip my hat to this pair of 2012 picture book beauties. Those two books? 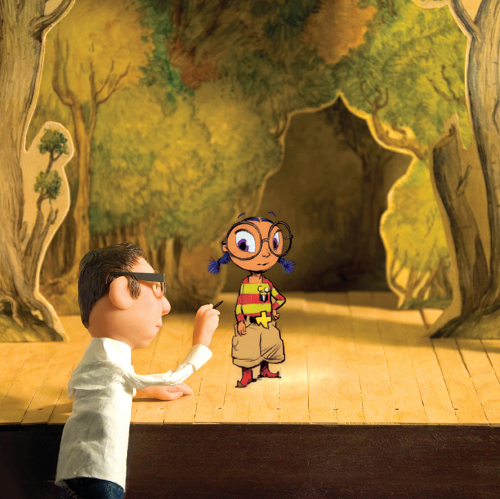 Jairo Buitrago’s Jimmy the Greatest, illustrated by Rafael Yockteng and released by Groundwood Books back in April (first published in Spanish in 2010), and Mac Barnett’s Chloe and the Lion, released by Disney Hyperion in the same month — with pictures from Adam Rex. “Our story begins when Don Apolinar, the owner of the gym, looked at Jimmy properly for the first time and suggested he take a run around the town. and the great huge sea. It’s not like fun stories set in poor Latin America villages appear on my desk every day. I read it and enjoyed it but it wasn’t until I reread it, and reread it, and reread it, and reread it some more that the sheer brilliance of this little number got to me. With a careful hand author/illustrator pair Jairo Buitrago and Rafael Yockteng have created a book that is an ode to the people who stay in small communities, helping and improving the daily lives of their friends and neighbors. This is a story that folks can relate to, no matter where they live. It’s a paean to the heroes of small town life. Unsung heroes, I have located your book. And I was just about to expend a bunch of words to describe Yockteng’s digital artwork, but I’ll let the art here today speak for itself. You can click each image to enlarge and see it in closer detail. 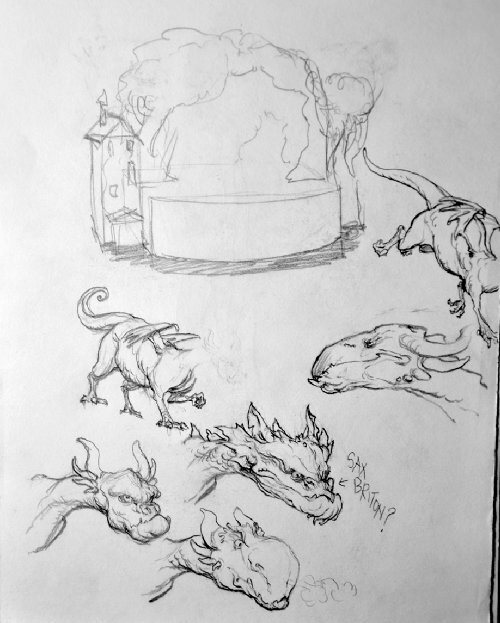 I don’t want to keep runnin’ my mouth here, since Adam has stopped by to share some of his early sketches and a bit of process, etc. Let me get to it, and I thank him for sharing. 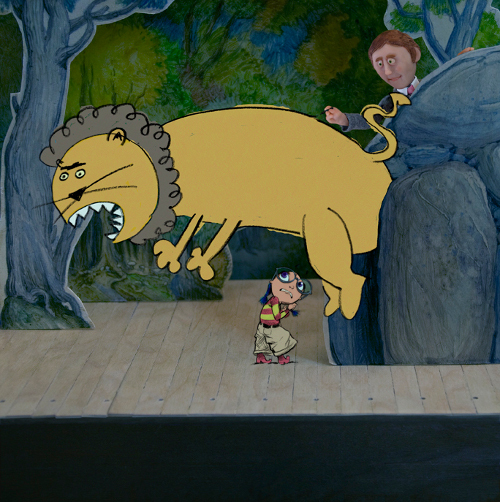 “…a huge lion leapt out from behind an oak tree. But here we have the same spread in the dummy stage. Obviously, in a book like this the dummy takes on a different quality than the sort of thing I’d normally produce, which would really just be black and white sketches. I had some concern that Mac and Disney Hyperion would have some difficulty understanding what I intended for Chloe and the Lion, if I only offered those kinds of sketches, so I went ahead and built the stage set I was envisioning out of balsa and bass wood and hoped I wasn’t wasting my time. 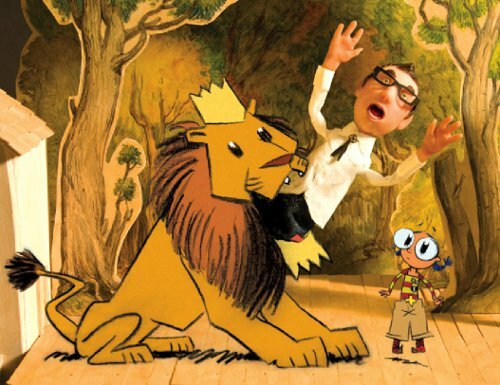 Another page from the dummy, at a point in the story when “Mac” is ostensibly drawing the lion instead of me. 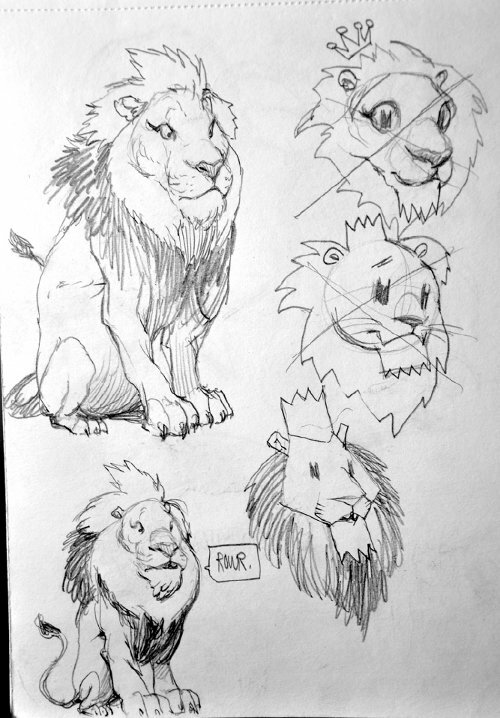 Except, for this dummy page, I actually did the lion drawing myself, with my left hand, taking some pains to forget thirty years of practice and training. But when it came time to put together the final page, Mac did the actual lion drawing. 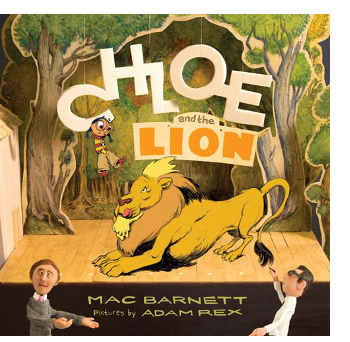 Chloe and the Lion is Mac’s illustration debut: It includes a number of drawings by him of the lion and of Chloe herself. 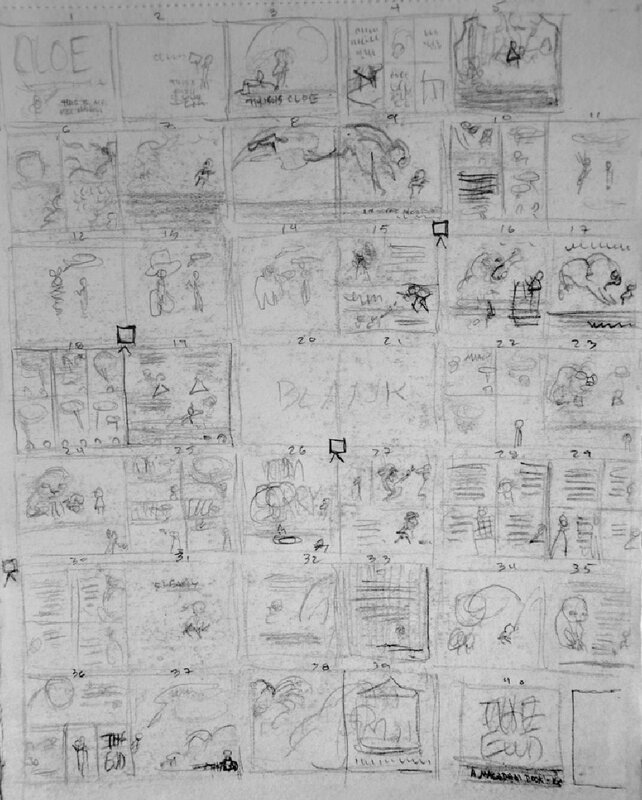 This is how my work on Chloe started, with the entire book mapped out in little thumbnail pages. The book eventually jumped from 40 to 48 pages, so note the little page-insert-carrot-notations throughout. 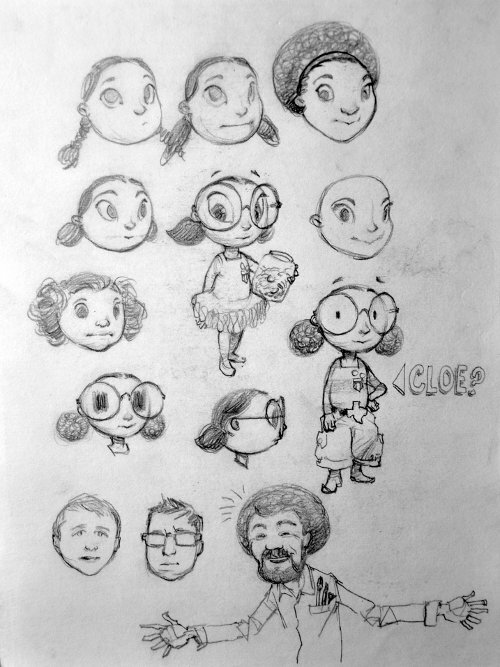 Early sketches of different Chloes. Also sketches of Mac, me, and Bob Ross. 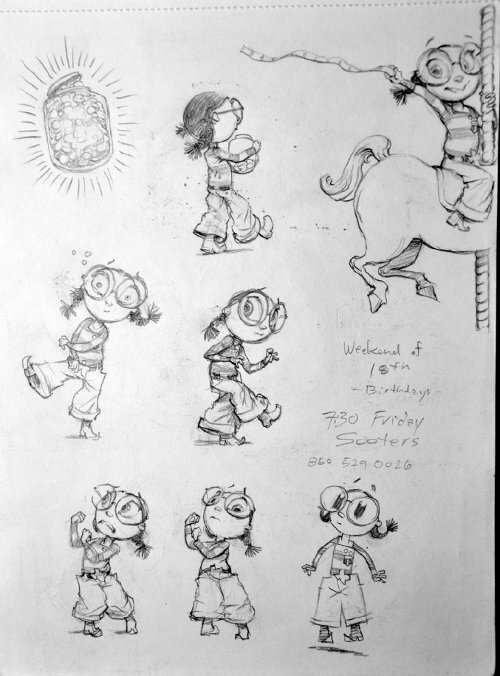 The sketches below were photographed and dropped right into the dummy spreads. 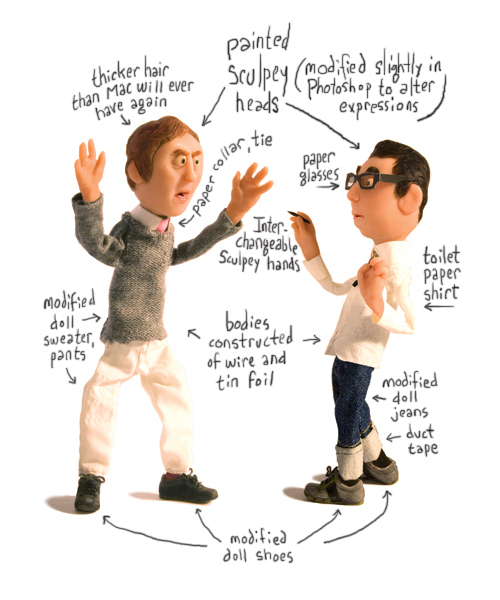 When it came time to sculpt the puppets, I had a lot of trouble capturing Mac’s considerable essence. 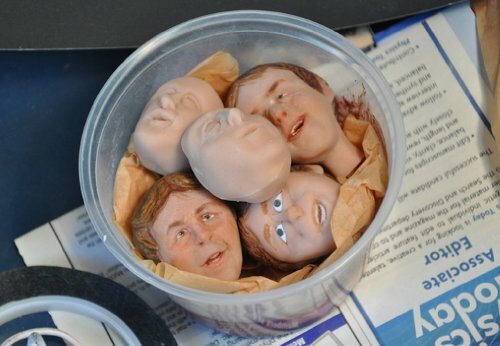 So, now I have a Tupperware full of reject heads, should I ever want to surprise Mac with a funny package like the kind Kevin Spacey sent Brad Pitt at the end of Se7en. 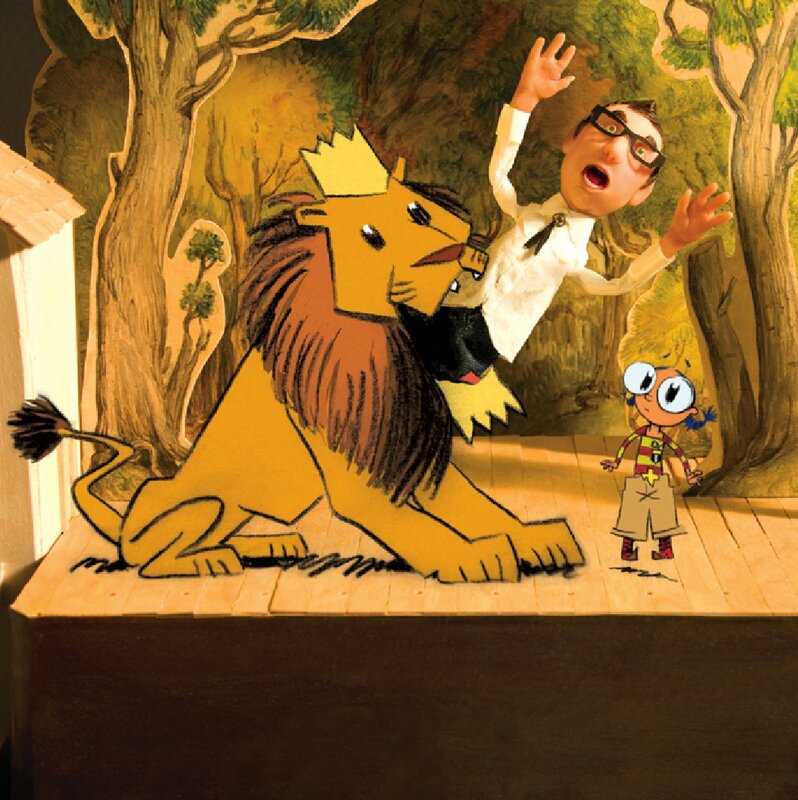 And the same, after I dropped in drawings of the lion and Chloe, adjusted levels and colors, pasted in a little empty stage over the figuring stand, and painted Adam a new expression. CHLOE AND THE LION. Copyright © 2012 by Mac Barnett. Pictures © 2012 by Adam Rex. Published by Disney Hyperion Books, New York. All images here reproduced by permission of Adam Rex. JIMMY THE GREATEST. English translation copyright © 2012 by Elisa Amado. Text copyright © 2010 by Jairo Buitrago. Illustrations © 2010 by Rafael Yockteng. Published by Groundwood Books, Canada. 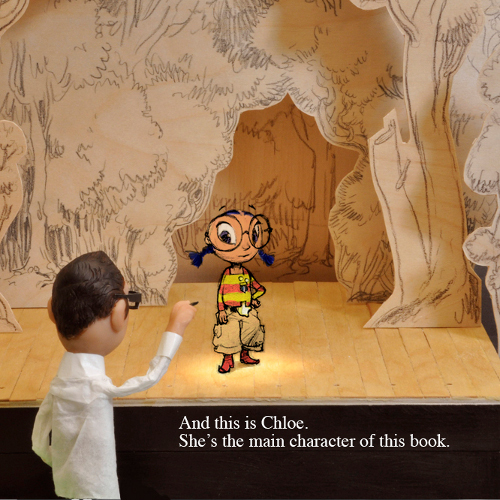 Spreads used with permission of publisher. This post is long enough today (though I’m extra happy to be sharing art from both Adam Rex and Rafael Yockteng), so I’ll keep it short this morning. I’m feeling kicky that my friends and my people had a good Thanksgiving and that I got to visit with Eisha (former blogger here at 7-Imp, for any new folks) and her boyfriend over the Thanksgiving holidays. I’m also taken with Jimmy’s notion (as in, Jimmy the Greatest above) of being happy with what you’ve got. 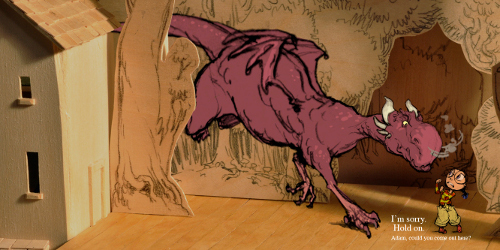 Also, Adam Rex makes me laugh. Always. Love these two flavorful books. They both have really distinctive text and illustrations. Can’t wait to see more from MACADAM! Those puppets must have taken so long to make, especially given the “reject heads.” Looking at them, I was getting a flashback to making shrunken-headed apple dolls in fourth grade. What amazing fun it would be to collaborate on a book with a friend. I hope I can do that one day. 1/ Observing our first snow of the season while at the grandfolks for Thanksgiving. 2/ Making a pumpkin pie with 7yo girl. 3/ Quietly writing/revising with a glass of wine after everyone else was in bed and listening to the November wind. 4/ Talking to an incredibly enthusiastic indie bookstore manager in Amish country, OH for a long time and realizing that no matter where you are, bookstores feel like home. 5/ Looking forward to a busy, fun week ahead. 6/ Watching 9yo play fiddle (reluctantly) at the assisted living residence we were visiting, at the request of one resident who saw his violin case. 7/ Having a safe trip to be with family, and being home again. Jimmy the greatest looks like a good one to read by the sea here. Rex and Barnett do not disappoint (as usual). Did you read Barnett’s essay on nonsense books? Jules- I’m glad you got to be with your people. I hope there was much pie. Jess- I love the image of the 9 year old playing for the forlks at the assisted living. 1. I had a Thanksgiving dinner that couldn’t be beat. 6. I watched the “African Cats” movie last night, beautiful. 7. Had fun updating my CafePress store. 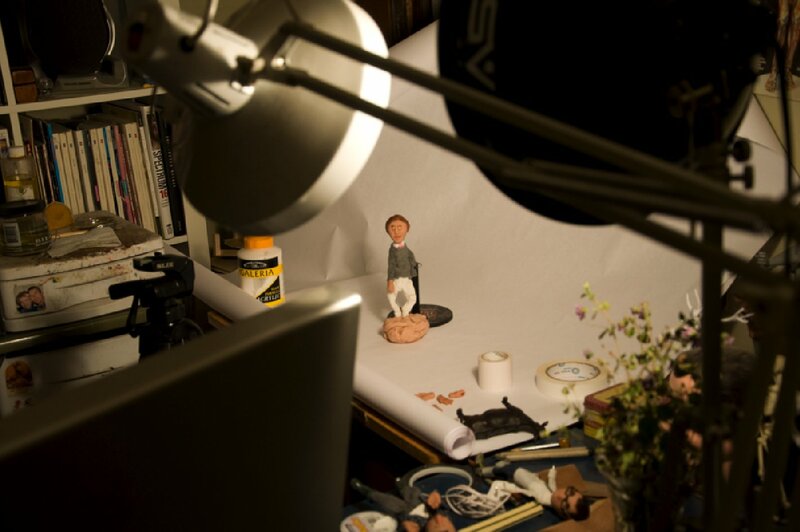 It’s fun to pick which objects to put my images on. I tried not to be too ridiculous. Thank you for sharing two great books. Being happy with what you got in Jimmy’s book is such a message. I love the Macadam book and the inside story. The Tupperware of heads is creepy funny. Jules, how fun to see Eisha. Jess, writing and the November wind sounds perfect. Moira, yay for pumpkin pie. 1. A break from school, Wed.-Fri.
2. A quiet Thanksgiving with husband and pooches. 3. Caught up on Downton Abbey. 6. Finished The Language of Flowers and Hatty Ever After. Jess, happy to read the trip was good and filled with good bookstores, fiddles, pumpkin pie, and quiet time to write. Moira: I hadn’t seen that essay. Thanks! That was a good read. … A Thanksgiving dinner that couldn’t be beat is what I like to hear, Moira. I saw some of your CafePress items and might have to go shopping there for the holidays. Jone, glad you had a big, long, juicy school break and quiet time with your husband. Do you know I still haven’t seen Downton Abbey? p.s. It’s good to read some kicks (since Mama Jules loves keepin’ up with her kickers’ wonderful lives), and I bet it’ll be—shhhh—-very quiet here today. Husband and I just finished season one of Downton Abby. We are totally hooked plus we like to go around saying, “Downton” all day. Another two (differently but still literally) wonder-ful books featured this week, Jules. Thanks! The implicit message of the Jimmy book means a lot to me, too. And the artwork captures it perfectly. Oh, Adam Rex. What I don’t know about picture books and illustrators would, as you know, fill a stadium. But you’ve trained me well to perk up my… er… eyes? at the mention of his name here. 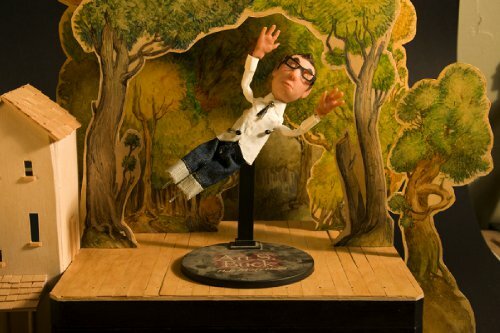 If you ever did a 7 Questions series of interviews with 7-Imp readers who don’t have anything to do with kids’ books, and asked what names instantly get our attention, his would be on my list. Jessica: I hope the American Booksellers Association pays you a gazillion dollars to license the slogan no matter where you are, bookstores feel like home. Just about every book buyer will nod and sigh and smile contentedly when they read that line. Ah, jone… I’d love to have had your week. On the other hand, I had a pretty good week too — so maybe I can borrow yours starting tomorrow or so? 1. FINALLY upgraded to a new version of the operating system on my home PC. I know, I know — where are the autumn leaves and pumpkins and tryptophan in a November kick like this?!? But trust me, this is a big and satisfying kick of a deal for me. 2. Finished The Girl Who Circumnavigated… and enjoyed it very, very much. Looking forward to the sequel you mentioned in last week’s comment, Jules! 3. Bonnie Raitt’s newest, Slipstream. 4. I’m not a “Black Friday” shopping fan, AT ALL. But a few days ago I came across this little item — a game, something like chess, but geeked-up with invisible lasers in the pieces — and knew I’d have to acquire it as a gift for someone. Preferably someone, like, extremely local, who already knows chess and hence can appreciate the subtleties of this variation. 6. In the absence of nearby family/friends to have or host Thanksgiving dinner with, we went out to a really really nice restaurant on Thursday. The Missus — non-traditionalist that she is — went with their regular menu. Guess who stuck with their take on turkey, cornbread stuffing, cranberry sauce, a sweet potato casserole, and a broccoli-based version of green-bean-and-crunchy-onions casserole. And — mmm, yes, — pie. 7. We’re hoping to go out shortly to see Skyfall, the newest James Bond film. Movie-going anticipation: zowie. Rafael: Three cheers for respect, dignity, and libraries. Adam: Cool mixed media. Also cool to see the different versions of Chloe and the others. Jules and Eisha: Yay for your visit! Jessica: What a nice mix of sights and sounds. Moira: Rock your art + goodies! JES: I just finished a book in which the dog didn’t make it, and I was a goner. Murder mysteries? No problem. Sci-fi/supernatural stories with attacks? No problem. A fictional cat with an injured paw or a sniffle? EMOTIONAL. I also like “Jimmy the Greatest”’s story of gifted local staying put to help his community. Especially that star-gazing beach scene. It’s hilarious that even left-handed, with the deliberate intention of being un-artistic, Adam Rex’s lion still shows his panache. ha! I like Chloe’s over-sized cargo shorts; something very character-defining about that choice. Jules – sounds like a good Thanksgiving and nice visit with Eisha. Thanks for sharing Rex & Yockteng with us. Jessica – revising with a glass of wine and the November wind. A nice image, nicely put. Jone – reading, writing, catching up on series and napping; certainly making the best of your break. JES – I spent several hours with my tech-savvy brother-in-law over Thanksgiving weekend considering the pro and cons of a needed system upgrade. I’m still teetering on the angst-filled, learning-curve abyss. I totally get your #1. Congrats on your leap! Enjoy Skyfall. Best overall Bond pic, I think. 1. the oven (heating the turkey) did not malfunction this year. 2. out-of-town family field trip: to LA Cathedral, Gehry’s Disney Concert Hall, view from hubby’s 37th floor office of the HOLLYWOOD sign to the ocean/Catalina Island. 3. Saw “the Life of Pi” – backstory slow, bit flawed, but LOVED all ship sinking, trapped-in-boat with tiger scenes. OMG the visuals! 5. fierce and laughter-filled card games. 7. I come from a family of teachers (3 generations at Thanksgiving) and I listen to their school stories. My fave this year: A student’s Mom went back and finished college after something my cousin said to her at her 3rd Grade student’s conference. Just some phrase about encouraging “lifelong learning” hit home. Pretty cool result. What great books today! I want to read them both. Like others I am impressed with the level of work that the little sets and models must have taken in the MACADAM book. I like all the Thanksgiving kicks. It is a holiday I would like to borrow from the US. Glad you got to visit Eisha, Jules! Jess, I have never been to Amish country but you’re right – bookshops always feel like home. John is on to something with the licensed slogan idea! Jone your week seems full of nice quiet kicks. I love those weeks. Moira I was going to ask what type of pie, but then realised that any pie is kick-worthy. John I am not reading a tear-jerker story before work but will read it later today. I love your first kick. Things like that can be extremely satisfying. Little Willow, you must have a good calendar system as it seems like you are always writing about things you are doing right now, definite things in the near and distant and future, as well as potential things! 1. My cousin’s wedding last weekend managed to fall in between the two thunderstorms we had last Saturday (before the Sunday one that knocked out the power). This not allowed us all to have photos and drinks outside before the reception, but provided a lightning show during the speeches. 4. Summer fruits have arrived. Mangos, yum. 5. Lots of veggie planting done yesterday. 6. There a frogs croaking in the local creek in the mornings. Actually, they sound like popcorn popping. I googled popcorn frogs Brisbane and found out they are striped marsh frogs. I love the internet. 7. And John, I know you like to hear how Australia is like Oz. We also have a local frog called the Pobblebonk. Love that name. John, congrats on kick #1, and I’m also happy that tryptophan made its way somewhere in someone’s kicks! … John, I immediately sent that link to my husband, who is teaching the girls chess. (Chess is not a game at which I PRETEND for even one moment to excel.) … I hope you enjoy Skyfall. I’ve actually seen that one. Our movie-going rate has been fairly good lately. Little Willow: Two offers! Congrats! Hope today’s audition went well. Denise: Glad to hear you liked Life of Pi. I’m intrigued, I admit. It’s been so long since I’ve read the book. … Pear and sweet potato tart? I might have to look up that recipe. And what a great final kick. Emmaco: That’s interesting that adoption is rare in Australia. I wonder why. … Glad to hear the wedding went well and that you’re surrounded by all that new life. Pobblebonk is a great name for a frog, but at first, for some reason, I thought it said pub. That’d be a great name for a pub, too. What gems both these books are. Being thankful for what you have is a great lesson to learn, as is not letting time pass you by. 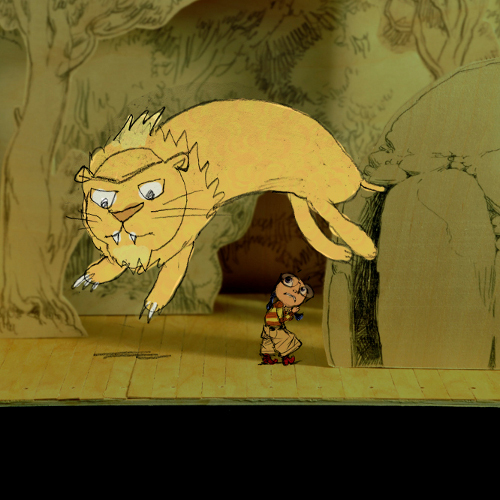 Really love nonsense books, and love the punch of the dragon coming out behind the tree instead of the announced lion. Jules – so glad you had a good Thanksgiving and got to see Eisha! Jessica – snow and pumpkin pie making – so jealous! Moira – thanks for that great link. Pie and Leftovers. Yum. Jone – hooray for breaks from school! And naps. John – Oh geez, you know I went straight to that link and started crying before I was even halfway through it – then promptly shared it with all my animal-loving friends. (I too became a Fiona Apple fan after reading her letter cancelling her tour because she needed to be with her ailing pup.) Damn but the love of animals is awesome and heartbreaking and something that connects a lot of people. LW – you are always so busy, that energy is inspiring! Hope the Fringe marathon was fun! And, yes, I am with you and Denise – Onward! Denise – those solving the world’s problems walks are some of the best. And those sound like my kind of card games “fierce and laughter-filled” love that image. Emmaco – dancing at a wedding, oh how fun! All babies should be so lucky to be so wanted – happy for all of them. I am googling the Pobblebonk as soon as I am done with kicks! Great name! 1) Bourbon soaked sweet potatoes, roasted brussel sprouts w/ carmelized onions & bacon, and Shrimp etouffee for a non-traditional turkey day. 2) Picked up Laini Taylor’s “Day’s of Blood & Starlight” Wednesday and devoured it by Friday. Now if she’d hurry up and finish the 3rd book in the trilogy before Christmas I’d be set! 3) Friends/co-workers going above and beyond on Wednesday to make sure one family’s Thanksgiving would not be ruined. I know and work with good people. 4) Movie marathon – Friday Night Lights – which was a great football movie and true (tv series is still better though); Captain America and Thor to round out comic book geekiness. 5) Baking pumpkin banana muffins. 6) Taking out the Christmas decorations. 7) Cole. I have now had him in my family for 11 months and he has come so far – he knows, really knows, this is his home. We made several trips to the dog park during the holiday, and while he still loves people more than other dogs, he engages in tail-wagging nose-sniffing greetings with the other dogs a lot more, and is a little less freaked out when other pups try to get him to play. Although his expression when they pounce is an obvious, “Hey! WTH?? Dude, what are you doing?” that cracks me up every time. He’s getting there, and its so fun to watch. Denise, I thought exactly the same thing about Adam Rex’s left-handed lion. And your kick #5 — the raucous card games — a favorite at this address too. Oh, emmaco… Pobblebonk, indeed. And of course Google led me to Wikipedia — specifically to one of those “disambiguation” pages, which informed me that if I wanted to learn about the Pobblebonk I had to specify WHICH OF THREE POBBLEBONK FROGS interested me. And — whew! — all three are Australian natives. Jules: if Mr. Jules is interested in purchasing the game, the best price I found last week — pre-BF — was at Newegg, of all places. (The main reason I first included the link to the Edmund Scientific site was its better writeup.) Oh, and there’s also an add-on you can get: two additional special pieces (one for each side), which split the laser beam into two directions. And Rachel — so so glad you’ve got Cole. Our own Pooch was always freaked out about other dogs (had to laugh at your “Hey! WTH? ?” description — very familiar!) until we’d left her a few times, for a couple hours at a time, with a loving trainer at a local doggie daycare facility. She (The Pooch, not the trainer) still doesn’t initiate contact, and she will often simply turn and trot away from other dogs, especially big ones. (She’s only 5 lbs.) But at least she’ll just relax and go along with it if contact is unavoidable. Jules, I think the adoption thing might be because there’s more social security for single mothers here/less teenage pregnancy, plus quite strict rules about overseas adoption. (I thought maybe abortion rates might be different but ours is slightly lower) We had forced adoptions of Aboriginal children until the 60s/70s so perhaps that has contributed to an unease over overseas adoptions. Denise, love the sound of fierce and laughter-filled card games. Rachel I have the new Laini Taylor here but will probably hold it over until a future date when I feel like I need a treat! The Pobblebonk has some interesting markings – especially the Western Pobblebonk. Google even led me to a children’s book called Limno the Pobblebonk. Here’s a link to a sample Pobblebonk chorus – funny thing is, they do sound a little like a banjo, with sounds that sound like “bonk”. The sound sample is on the left side of the page. Oh, and emmaco – if you liked the first book you’ll enjoy Days too. John – I am glad I have Cole too. Hard to believe he is my 2nd pup since my beloved Cheyenne passed on. Had a conversation the other day with the ex-bf about how you need to honor the memory of the dogs that came before, and that having the new pups, who keep you firmly in the present, is part of how you do that. Oh, and Cole outweighs your Pooch by roughly 91 pounds! A Late Hi to Jules and All Imps! I enjoyed every bit of the post, pictures, lions, girls with big glasses , sill crazy artist/writer teams, South American boxers, hope in tough circumstances. Also, Imps and Kicks. 2. 2 Thanksgiving dinners – one Wed, one Thurs. 3. A spitting of snow which thrilled my Little. Living in LA, he’s always pining for snow. 4. Watching the first Harry Potter movie with my neice and nephew and ‘Bridget Jones, The Edge of Reason’ with one of my sister-in-laws. 5. Ohio – did I mention Ohio? 6. Morning of Ohio State’s big rivalry football game against Michigan I got to attend. my first Ohio State marching band Skull Session aka band warm-up and whip-fans-into-a-frenzy-session. Lots of fun and incredible music. Important Note: I’m really a Boston Red Sox fan through and through but this was fun! 7. Looking forward to my parents moving to my neighborhood in LA on Friday (yes!!!!). I *love* that frog chorus, Rachel! (Besides the bonking banjos, the other one I like is the whoop-whoop-whooping siren.) I so wish I could play it LOUD on our back deck. I picture a lot of confused North-Florida wildlife suddenly stunned into silence. And/Or attacking the house. Rachel, COLE! 11 months! Rock! Bourbon-soaked sweet potatoes is also gonna have to be something I look up. Your movie marathon sounds fun, but your co-workers sound even better. Allison, what a good week you had … and Friday the parents move in? That seems like it happened so quickly. Very exciting. I hope it goes smoothly. Forgot to say, thanks for the link Rachel! very pretty. Our Pobblebonks just mostly make a bonk noise like . I will have to go visit our neighbour’s pond one night and see if they are making banjo noises. My friend collects native Australian animal picture books, I will have to see if she has the pobblebonk one! I didn’t know it snowed in LA, Allison! Exciting. Mac Barnett’s book is so fun. My 7-year-old son loves it, and he enjoys writing. I will have to share this post with him! I love posts like this that reveal all that went into making a book. The picture of the set Mac Barnett built gives me a new level of respect for this book.